So this may seem off topic but colour has a lot to do with food and our health. I for one love to eat things that look beautiful and colourful. 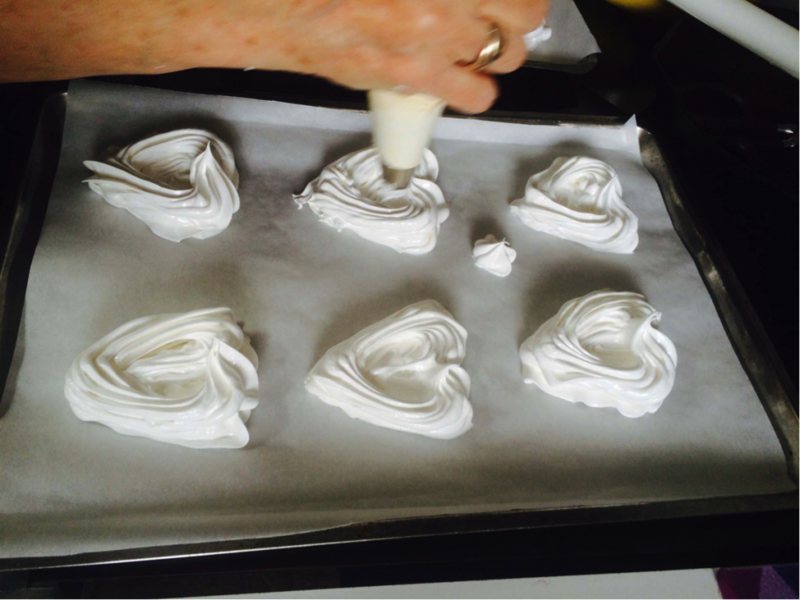 Years ago, I wanted to learn how to make meringues. I had tried many times but they always turned out badly. Finally, I signed up for cooking lessons at a french school. They had hired a french speaking chef who would teach us to cook as he spoke in French. This accomplished two goals: 1) to brush up on my french and 2) learn how to make meringues. My husband and I had never had the chance to have a honeymoon and so we had saved to go on a cycling trip in France. I certainly learned a lot about cooking and my french was quite good when it had anything to do with food and cooking. Unfortunately, when my husband broke both his arms on that trip, I was not help much at the hospital. ???? But that is another storey. 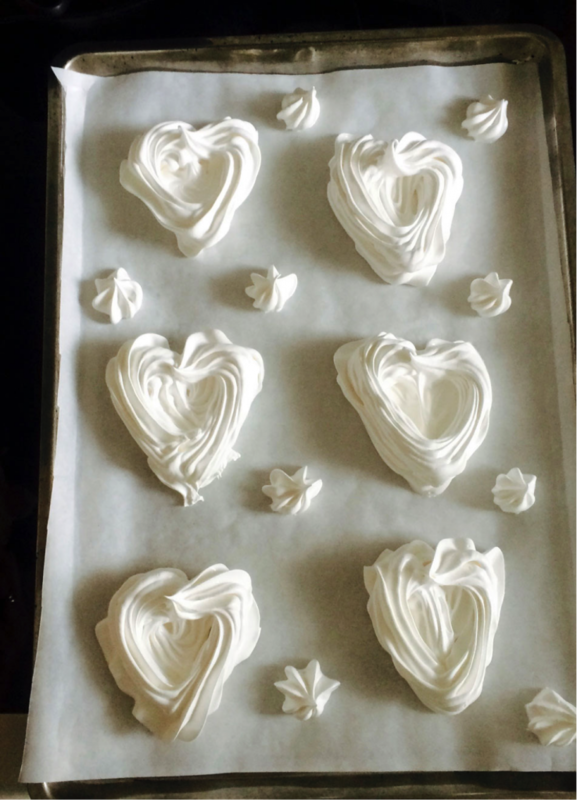 Here are my meringues about to go into the oven. A few weeks ago I volunteered to make the dessert for a dinner party with a group of friends. Desserts are my specialty. I love the colour in desserts and this one is my favourite. Here are my meringues about to go into the oven. 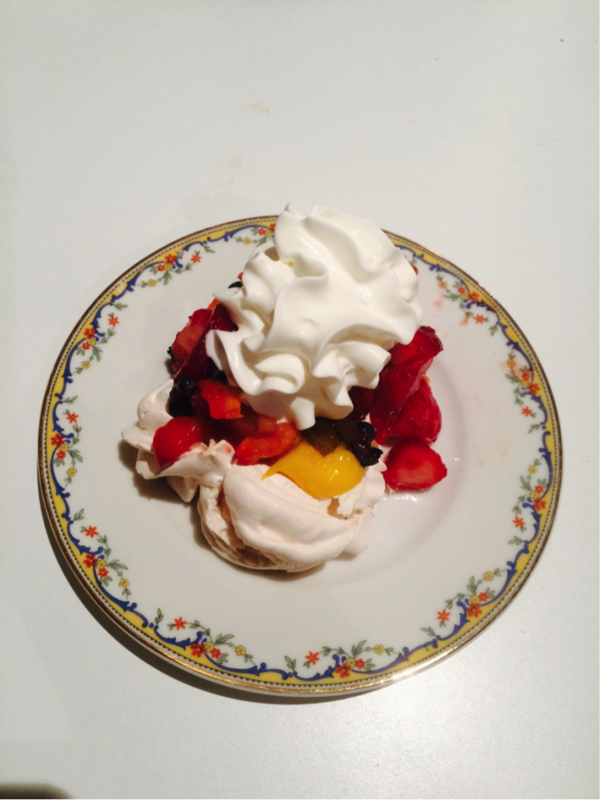 Here is what Chef Fernand Boulanger taught me about making meringues. This is his recipe. 2 drops of vanilla (optional) They are good either way. 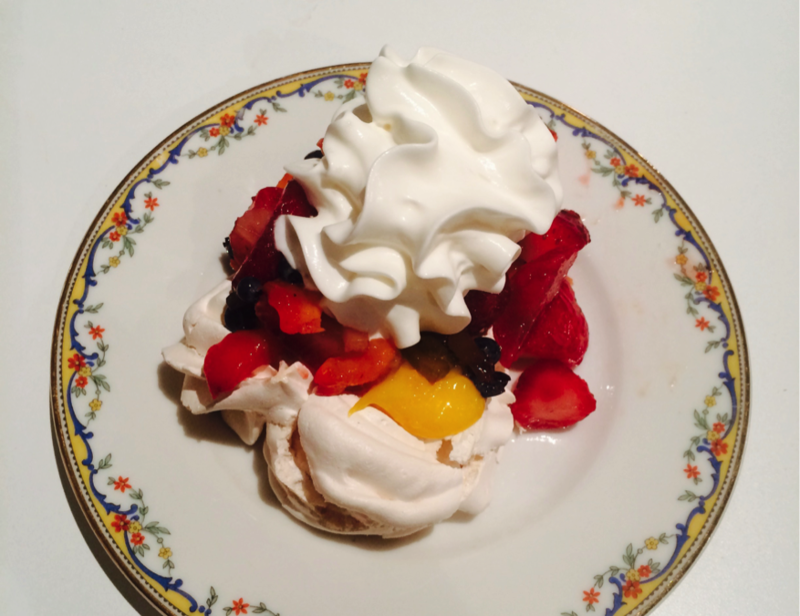 Now I have read many ways to make meringues but what Fernand told me was simply this…..put the eggs in a bowl, start the mixer,beat one minute, then slowly add the sugar and then walk away from the mixer for 10 to 15 minutes. If you have a handheld you are stuck holding it! Now I have heard that you can over beat meringues and make them tough. Not my experience. 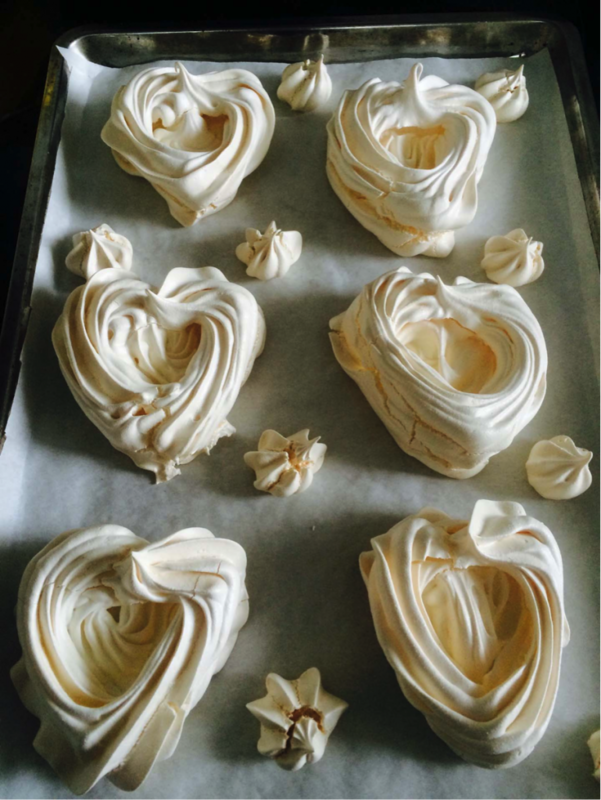 All I know is that my meringues come out perfectly no matter what the weather or the temperature outside. Meanwhile I have warmed the oven to 300 degrees. When the timer starts ringing I get out my large pastry bag. Notice how the top is turned down. That is important because you keep the sticky meringue off the top and keep your hands clean. 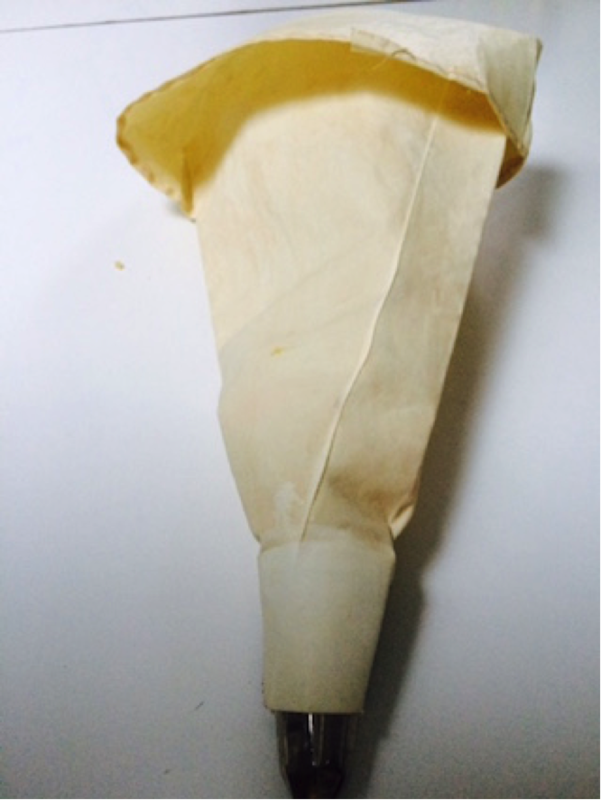 Next I insert a large serrated tip that you see at the bottom of the pastry bag. Below is a close-up so you can see what it looks like. Notice how the top is turned down. I then put the meringue in the pastry bag and I pipe out whatever shape I want. This was a dinner party that celebrated a wedding and so I used hearts. You make the outline of the heart first and then fill it in. Last, you put a second layer on top of the original outline to make a nest. Leave enough room because they do expand as they cook. Here is the finished batch. They take about 30 minutes. What you want to see is a pale beige meringue that is just starting to crack. That means they will be chewy inside. If your stove runs hot lower the temperature to 275. To finish the dessert I put some lemon curd in the nests. The lemon gives a tang to the sweetness of the meringues. It also uses the four egg yolks left behind. But, you can add jam or custard or simply whipped cream. Then add whatever fresh fruit you love and a bit of whipped cream and you have a beautiful dessert that really wasn’t too hard. But people will think you slaved for hours.